Delta Scientific vehicle crash barriers protected the pope on his travels to the U.S. in late September. A total of 18 Delta Scientific 12- and 16-foot MP5000 mobile deployable vehicle crash barriers protected the pope on his travels to the U.S. in late September. 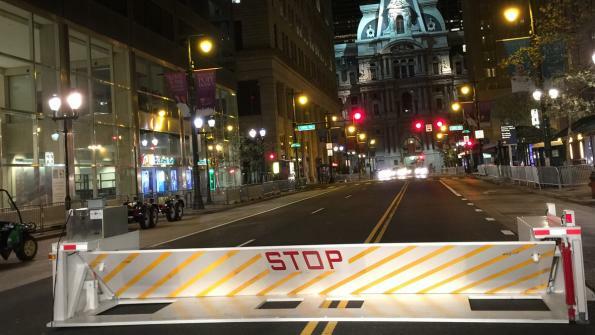 The barriers helped police and security personnel protect the pontiff from vehicle bomb attack and errant drivers as he traveled to various venues in Washington, D.C., Philadelphia and New York Sept. 22-27. Global Access Control Systems (Pittsburgh) provided the barriers. At each location, the totally self-contained MP5000s were towed into position and controlled vehicle access within 15 minutes. No excavation or sub-surface preparation was required. Once positioned, the mobile barricades unpacked themselves by using hydraulics to raise and lower the barriers off their wheels. DC-powered pumps then raised or lowered the barriers. The shorter mobile deployable vehicle crash barriers carry a K4 rating (M30 per new ASTM rating), stopping 7.5-ton vehicles traveling 30 mph. The longer MP5000 meets K8 rating requirements, stopping the same sized vehicle at 40 mph. Over 1,000 of the MP5000 mobile deployable vehicle crash barriers are being utilized throughout the world. The high security portable barricade system is towed into place by a light three-quarter-ton pickup truck. Many of the MP5000s are being used in the Middle East to protect US troops from truck bomb attack. Both the operation of the barrier as well as deployment and retrieval are push-button controlled. A standard system includes a battery-operated power unit, replenished from either a solar array or local low voltage source. Optionally, a Delta Hydraulic Power Unit operated on a locally supplied power or full manual system, or combination, is available. Both the locally powered and battery powered hydraulic pumping unit can be sized to provide pass-through rates suitable for most inspection and identification station requirements. Operating modes include full automatic, remote-hard line, remote-radio, card reader, key switch, local guard push button controls or via master and slave control panel. Palmdale, Calif.-based Delta Scientific Corp. is a manufacturer of vehicle access control equipment. The firm’s three product lines consist of high-security vehicle barricade systems, parking control equipment and guard booths. The company has been engineering and manufacturing vehicle access control equipment since 1974 and sells its products worldwide. Video shows a crash test with the Delta Scientific MP5000 crash barrier.